I am actually looking forward to fall weather! I usually am pretty reluctant to see the warm summer days go, but this year, our lovely sunny days have been marred by smoke! This has been one of the worst years ever for wild fires in British Columbia, and with several weeks left in fire season, could end up being the worst ever in terms of hectares burned. All the fires have caused the air quality to be extremely poor and many days it was not pleasant being outdoors and hard on your lungs and eyes. So, cooler weather, with sweaters, frost, RAIN, and pumpkin spice anything is sounding pretty welcoming right now! 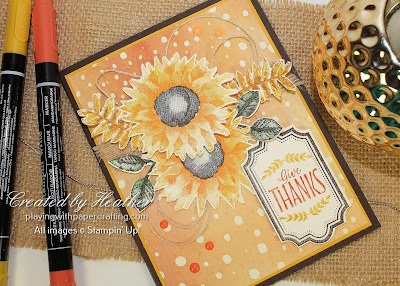 I was very excited to celebrate that with my first card using a gorgeous new stamp set from the upcoming 2017 Holiday Catalogue called *Painted Harvest. If you were to ask me what the best thing from the new catalogue was, I think I would have to choose this set. The art work is stunning and you can create some absolutely gorgeous fall scenes with it. Pair it with the coordinating *Painted Autumn Designer Series Paper and bundle it with the *Leaf Punch, and you've got yourself an incredible set. *Products from the 2017 Holiday Catalogue, available for purchase Sept. 1, 2017. The sunflowers actually use 3 step stamping to get to where you see them here. I like to start with the more detailed stamp in a darker colour. Here, I used Peekaboo Peach. Then I stamp the background colour in Crushed Curry and finally, the center in Early Espresso. I kind of love how they turned out. I fussy cut them because there are no framelits to go along with this set. The leaves are also 2 step stamping. The 3 leaf twig is stamped first in Early Espresso and then in Garden Green, while the frond-like leaf is Cajun Craze and Crushed Curry. While I also had to fussy cut the frond-like leaf, the other leaf could be punched using the new *Leaf Punch, which is part of the bundle with this stamp set. The sentiment is from the new *Labels to Love stamp set, also from the upcoming Holiday Catalogue. It pairs with the new *Everyday Label Punch, but is not with the bundle. I first stamped the frame using Early Espresso ink, then inked up the sentiment using Crushed Curry and Tangerine Tango Stampin' Write Markers. 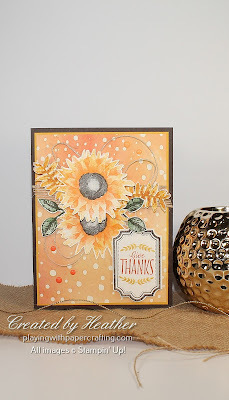 The background panel is from the *Painted Autumn Designer Series Paper, which is handpainted and gorgeous in it's own right! I created some texture using Linen Thread and Burlap Ribbon, and added a few Enamel Dots. Go to PaperPumpkin.com and click on subscribe. 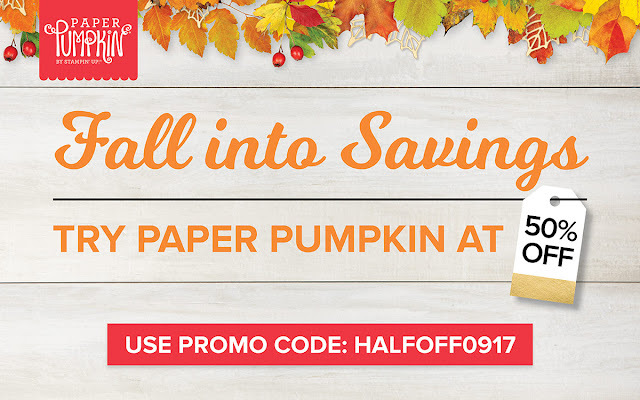 Don't forget to use the Promo Code: HALFOFF0917! This promotion is for first time subscribers only.